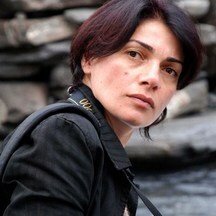 Biography Natela Grigalashvili is a Tbilisi based professional photographer and a chronicler recording the life of the normal people in the country with her camera. She is concerned with documenting the way of living that has endured until today. She grew up in the rural environment and is very familiar with the way of people’s living there. Natela photographs her relatives, friends and simple people, who enjoy their basic life, sometimes full of happiness, sometimes burlesque. Natela Grigalashvili participated in solo and group exhibitions: ABC Book (2012), Definitions (2011), My village, Bookhouse, Tbilisi Dysfunctional Country (2004), Guest Ateliers (2003) etc.